Removable Dentures Remain a Viable Option for People with Total Tooth Loss - R. Tracy Durrett, D.D.S. By R. Tracy Durrett, D.D.S. Although highly preventable, total tooth loss continues to affect millions of people worldwide, harming their nutrition, health and social standing. In the United States alone, a quarter of adults between 65 and 74 suffer from total tooth loss. Fortunately, there are a number of ways to restore lost teeth, including fixed bridgework and dental implants. These fixed solutions, though, can put a strain on finances; implants in particular require a minimum amount of bone in the jaw, which may not be present in people with extensive tooth loss. In these cases, removable dentures, time-tested and affordable, are a viable option. While the technology is simple, adaptable and effective, creating custom-fitted dentures is a painstaking process. It begins with an impression mold of the patient’s jaw ridges that once supported the natural teeth. A dental lab technician uses the impression to fashion a life-like plastic resin base, making sure the final dimensions won’t interfere with the patient’s cheeks, lips, and jaw movement. The prosthetic (artificial) teeth, each chosen to match the patient’s facial structure and past appearance, are then carefully positioned on the base. Teeth positioning on each denture arch must also balance with the opposing arch to assure a good bite. Once delivered, the dentist may make other adjustments to assure they fit comfortably within the patient’s mouth. 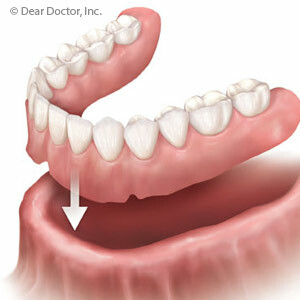 Dentures also require regular care and maintenance to ensure a continuing good fit and an overall healthy mouth. Your gums will still be susceptible to disease, so cleaning and maintaining both your dentures and the mouth’s soft tissues is an ongoing necessity. The lack of natural teeth can also lead to more bone loss, which can cause the dentures to lose their accurate fit and make them uncomfortable to wear. To remedy this, we can add more resin material to the dentures to refit them or, in extreme cases of poor fit, create a new denture to match current gum contours. Alternatively, we can install a few dental implants that will support the denture instead of the gum ridges, which would inhibit further bone loss. To learn whether dentures could be a good option for you, we’ll first need to conduct a thorough examination of your mouth. It could be this original tooth replacement system will bring back the teeth and smile you’ve lost.